There is no ‘Happy’ Memorial Day And I despise businesses that have ‘Memorial Day Sales.’ Have some respect for those killed in action. As long as I’m firing off salvos, Memorial Day IS NOT a day to thank veterans for their service. There are 364 days out of the year for that... or, Veterans Day. As said, please have respect and honor those who made the ultimate sacrifice, during combat, in the service to the United States of America. Memorial Day is, was, and always will be a somber day... at least for me it is. Hear, hear, Gunny. It IS about those hearts that were silenced in war. 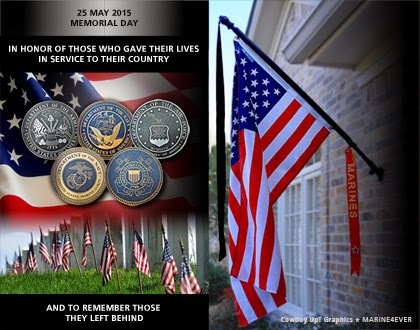 But one general action, in my humble opinion, that helps add to the mutation of the day's meaning: its when well intentioned folks lay flags at every military headstone - even at Arlington. And I do think of vets - like you - each and everyday... Today included... I grieve for your brethren and their families. Very well, and profoundly, said, Koji. Thank you for your comment. I'm grateful to be here, too, Ed! Nothing but respect for Tommy Adkins. You mean Atkins, Kid? Yeah, ME TOO! You have a great weekend, too, WHT dudette.